Spray 4- to 5-quart slow cooker with cooking spray. Place onion in slow cooker. Place beef roast on onion. Sprinkle with garlic, chili powder, salt and pepper. Pour tomatoes, broth and wine over roast. Remove roast to cutting board; cover to keep warm. Ladle cooking liquid into 2-quart saucepan; heat to boiling. In small bowl, combine cornstarch and water to form smooth paste; stir into boiling liquid. Cook and stir 1 minute or until thickened. 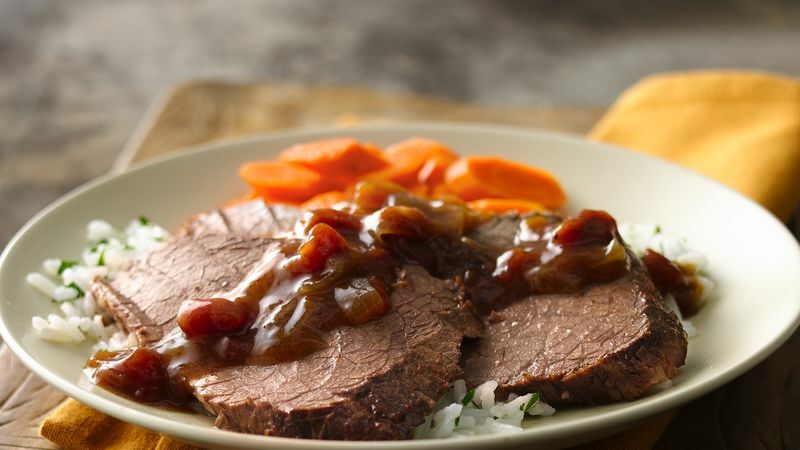 Slice beef; serve with gravy. If you have leftovers, shred the meat and refrigerate. When ready to serve, reheat and spoon into a warmed flour tortilla; top with salsa, cheese and other favorite taco toppings.